Summer is the best time for open air museums! Summer is here. So if we’re lucky, the sun will make an appearance and temperatures will rise – conditions that aren’t naturally conducive to paying a trip to the museum, you might think. However, some museums thrive outside. And this month’s Museums Corner has four such recommendations, whether it’s under the waters of the sea at the Øresund Aquarium, time travelling at the Open Air Museum and Esrum Abbey, or treasure hunting at an old World War 1 fort. Just next to the sea in Helsingør you’ll find the Øresund Aquarium. It’s a small, but beautiful saltwater aquarium focusing on the animals living in the Øresund. You can admire octopuses, fishes and crabs in the tanks inside and let your hands dive into the touch basin. Or why not grab a fishing net and go crab fishing, go snorkelling, or hop on board a motorboat and go porpoise spotting. 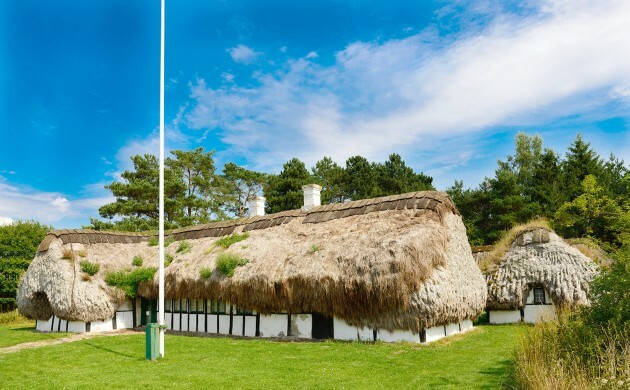 Open Air Museum, Kongevejen 100, Lyngby; May 1-Oct 23, open Tue-Sun 10:00-16:00; free adm (small admission fee in mid-summer); en.natmus.dk/museums/the-open-air-museum. When you enter the Open Air Museum you’ll instantly travel centuries back in time. Stroll along the gravel roads and visit the fully-furnished homes of the people of the past, such as the peasant, the wealthy miller, the village weaver or the inmates of the poorhouse. This fascinating time warp is one of the largest and oldest open air museums in the world. Right now, the gardens are in full bloom, the geese’s eggs are hatched and the horse-carriage is ready to roll. You are a recruit! Are you ready to prove that you have what it takes to become a soldier? Every Saturday and Sunday in June you can go treasure hunting dressed up like a recruit solving tasks and explore the ramparts at Mosede Fort. The construction of Mosede Fort was initiated in 1913 and completed in 1916, and the fort was an active part of Denmark’s military defence from 1916 to 1922. Make history come to life and let your imagination run free for a day.